4 Bedrooms, 3 1/2 Bathrooms, sleeps 11 comfortably. 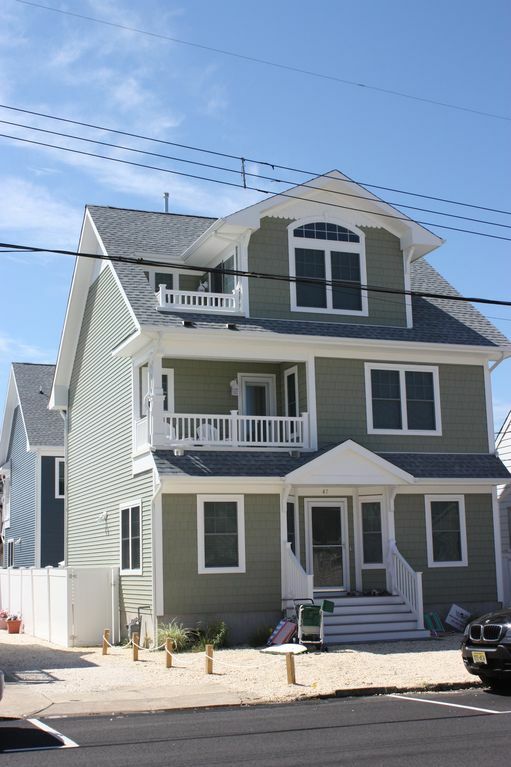 Beautiful brand new home located on beachblock. Decks with view to the beach. Outdoor shower, 3 1/2 bathrooms, 4 Bedrooms, Sleeper sofa. Granite kitchen and island with stools. Washer/Dryer, microwave, TV, DVD Player etc. In walking distance to fine restaurants, Miniature golf and arcade, just 15 minutes to Seaside Heights Boardwalk heading south, or 15 minutes to Pt Pleasant Boardwalk heading north. Crabbing and boating nearby. Call to check for immediate availability. Our extended family enjoyed this wonderful modern and well equipped home last week making it one of our most memorable family get togethers to date. Located steps away from the beach and enjoying great views and ocean sounds from two decks the house is the perfect shore vacation destination. The only problem we encountered was the incessant daytime noise on our block due to post-Sandy reconstruction. The evenings were very peaceful, however and we are already making plans to return next year! $500.00 refundable security deposit. $150.00 cleaning fee.